The 15th Sakyadhita Conference in Hong Kong drew around 900 participants from around the world, including Ven. Jampa and Ven. Semkye. Ven. Jampa share her experience. Sakyadhita International is the world’s leading organization of Buddhist women (and men). Their mission is to help transform the lives of women worldwide. Sakyadhita holds an international conference every two years, the first of which was held in Bodhgaya, India, in 1987. 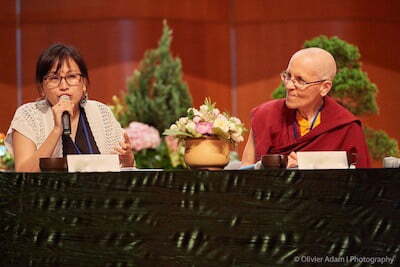 This year, the 15th conference, held in Hong Kong, celebrated Sakyadhita’s 30 year anniversary. Ven. Semkye and I had the opportunity to attend. Sakyadhita conferences are held in different, usually Buddhist, countries. Approximately 1 million Buddhists live in Honkong and there are around 400 Buddhist temples. About 900 participants from different countries attended the six day conference at Hongkong University. The days were filled with meditations in the mornings. There were many presentations in morning and afternoon sessions, and then workshops, Dharma talks, and cultural events in the evenings. It was a rich program with lots of variety. The presenters submitted papers well in advance, which they delivered at the conference. They often combined their talks with PowerPoint presentations, which made them even richer. I had been invited to the conference to support a German nun, Ven. Thubten Choedroen, co-founder of a German nunnery called Shide (established in 2005). She made a presentation about this nunnery, and I added information about the monastic training and support provided by Sravasti Abbey. Ven. Semkye reads a presentation. In the Opening Ceremony on the first day, Jetsunma Tenzin Palmo (President of Sakyadhita International) and Ven. Lekshe Tsomo (Co-founder and organizer) among others gave a short welcoming speech in the Grand Hall of the University of Hongkong. The second day of the conference focused on “Mindfulness Across Cultures” and “Building Healthy Families & Communities,” with more than ten presentations. For example, Terri Sivilli’s paper emphasized the “Interface Between Buddhism and Western Meditation-Based Secular Intervention.” Terri pointed out that it is important to be careful that companies don’t use meditation as a tool to make their employees more obedient or, in other words, to shut them up. After the presentation, a young woman shared with me her personal experience with such abusive approaches. In the end, she decided to leave her company as this treatment was not in accord with her human values. Therefore, it’s important that we speak about those issues and take initiatives to work against such developments. The third day was about “Buddhism & Social Action” and “Religious Status of Women Buddhist Practitioners.” Two presentations were enlightening for some of us who were ordained as bhiksunis in Taiwan. Both presenters, Ms. Yuchen Li and Ms. Wei-yi Chang, emphasized the history and growth of Buddhism and the Buddhist sangha in Taiwan. They shared stories of cooperation among women and the importance of education for women and nuns in Taiwan. Highly educated nuns and the support of elite Buddhist laywomen brought great benefit to the establishment of the bhiksuni sangha in Taiwan. Taiwan has more than 9 million Buddhists (40% of the population), 30,000 of them are monastics, and over 75% of all monastics are nuns. Also, see Ven. Semkye’s Bodhisattva’s Breakfast Corner talk on how nuns at Luminary Temple transformed a failing Taiwanese school. Ven. Semkye and I also had the opportunity to do posadha—the bi-monthly monastic confession and restoration ritual— with over 50 Korean nuns in Korean. About 40 Vietnamese nuns joined the posadha. as well as five of us from the Tibetan tradition. It was an enriching experience to do this important Vinaya ritual with nuns from different traditions. Right after the ceremony, Jetsunma Tenzin Palmo gave a talk on “Cave or Community.” Jetsunma illustrated quite vividly both ways of living, and how they can benefit practitioners. She also spoke at length about life as a layperson and the opportunities they have. Nowadays, with technology and the fact that lay people are highly educated, they have great opportunities to study and understand the teachings. She encouraged everybody not to waste time but to practice and study the Dharma. She advised a simple regular practice. She also encouraged everybody not to wait for the right condition, the right teacher, or the right community to come in order to practice. Rather, she said, to start right away. On the fourth day we had panels on “Female Images of Enlightenment and Gender” and “Equality: Only a Dream? Or, Are Buddhists really Equal?” This latter panel might have challenged some of the modern ways of how we see the roles of Buddhist teachers, monastics, and lay practitioners. Some of the presentations emphasized the power of women, especially in their roles as partners of yogic practitioners or as yoginis themselves. For example, Pema Khadro encouraged us to recognize the existence of yogis and yoginis as a third category of highly realized practitioners besides monastics and lay followers. Those yogis/yoginis can be quite accomplished. Some are celibate, but not all. Our last day started with more than twenty focus groups on such topics as Social Engagement and Buddhism, Buddhism and Justice, Future of Sakyadhita, Science and Buddhism, and Monastic Training in East and West. Most of the Western nuns joined the focus group on Monastic Training in East and West. Jetsunma Tenzin Palmo shared about the difficulties of Western nuns, particularly the lack of financial support from their Tibetan teachers and from lay people. She brought up very sad examples of monastics who have been treated very badly or lived under difficult circumstances although contributing greatly to the developments of Buddhist centers. This topic of support for nuns came up throughout the conference. I learned quite a bit, especially during the discussions and sharing, not just about the lack of support for Western Buddhist nuns in the Tibetan tradition, but also about the cultural gap between East and West in that regard. Westerners still tend to support their spiritual Tibetan teachers and Tibetan monastics in exile more than the Western monastics of the Tibetan traditions, even though the nuns help their Buddhist centers, teachers, and many students. Few Western monastics who either live in Asia, work in Western Dharma centers, or who have supported their Tibetan teachers receive financial support in return. Another challenge is that Western monks and nuns are more individualistic than their Eastern counterparts. They can be reluctant to join communities because that entails following the monastery’s daily schedule, internal guidelines, and rules. And for many, age is a factor. There is some good news, however. Recent years have seen increased opportunities for how to improve the situation for Western monastics. Sravasti Abbey is one example of offering support for Western monastics in the Tibetan tradition. The Abbey offers training in the monastic discipline for every monastic who wants to join. Moreover, for decades now, Taiwanese temples have supported Western nuns to receive their bhiksuni ordination and given training in the monastic vows. Korean temples also offer their support for bhiksuni ordination, and even train Western nuns for several years in their temples. Despite the kindness of the Asian bhiksunis, training at their monasteries presents Western nuns the challenges of learning a foreign language and living in a different culture, situations that some nuns hesitate to embrace. In summary: It was an honor to be able to attend the conference, to connect with so many other participants or to meet old friends, and to deepen our connection and support. It was inspiring to talk with so many different Buddhist women, to learn about their monasteries, centers or projects, and to hear what they are doing or what they are inspired about. The Sakyadhita conference is an empowering event that brings inspiration to everyone who attends. Everybody has the opportunity to share and grow, to receive support and encouragement. It’s a forum for men and women equally to support women’s rights and gender equality, allowing us to encourage, learn from, and empower each other. Maybe the 2019 Sakyadhita conference is your time to join and support Sakyadhita— “the Daughters of the Buddha”—International, Follow their website for the next conference announcement. It’s up to us to create our experiences in the future.